Lucky Tree Online Slot is 5 reel, 30 payline video slot powered by Bally Technologies. This slot looks amazing and the visuals and design overall is created in Asian style. Behind the reels, you can see a glimpse of beautiful, purple toned landscape. Far behind there are mountains covered in mist. On the right side of the reels, you can see a tree filled with Chinese coins on the lucky tree. 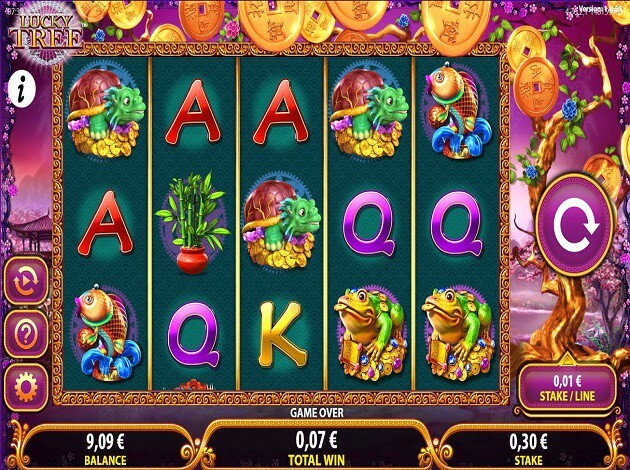 In Lucky Tree video slot, you will find two different Wild symbols, dragon, and a lucky coin. Lucky cat and yin yang symbol are also special symbols in this game. Both symbols are found in regular and wild versions. The theme of Lucky Tree video slot is Asian, mostly Chinese. It takes you to admire beautiful view and ancient tree, filled with Chinese lucky coins. These golden coins have a hole in the middle, and usually, red ribbon threaded through it. Three fortune cats on the reels will take you to the bonus game in which you will get to choose one of the shown three spheres. Click a sphere and it will reveal a number of picks you will get for the actual bonus game. You will get 6-12, 14 or 15 picks. After the number of picks is revealed, you will get to see 5×6 sized area filled with cards. Behind these cards, you will find different symbols, all related to Chinese astrology. The fortune cat pays the biggest wins and snake pays the lowest. Try to find at least 2 similar symbols, and you will get the wins! If you get 3 yin yang symbols on the reels of Lucky Tree, you will get the Free Spins Bonus and get rewarded with 10 free spins. You can also retrigger this feature, by landing 3 more yin yang symbols on the reels. Free Spins are played with the same bet value as the spin that triggered them, but the reel set will be different. You can’t trigger the bonus game during the free spins, but after every spin, you will get to enjoy Wild Coin Mystery Feature. When the Wild Coin Mystery feature triggers, the lucky tree next to the reels will shiver and drop some of the coins on the reels. 2-7 golden coins will randomly appear on the reels, covering other symbols. These symbols act as wild symbols. During Free Spins, the Wild Coin Mystery Feature activates after every spin and will give you at least 3 wild symbols on the reels.